To establish that someone has consented to sexual activity, the person must receive consent verbally or nonverbally in an unambiguous way. Both/all participants must be fully conscious and not incapacitated by drugs or alcohol. Both/all parties have clearly communicated their desire to participate in the act. Both/all parties are positive and sincere (no manipulation, coercion, or force). Either party has the ability to change their mind at any time. *Remember that whoever is initiating the sexual act has the responsibility of confirming consent. Some people are worried that talking about consent will be awkward or that it will ruin the mood, which is far from true. If anything, the mood is much more positive when both partners are happy and can freely communicate what they want. 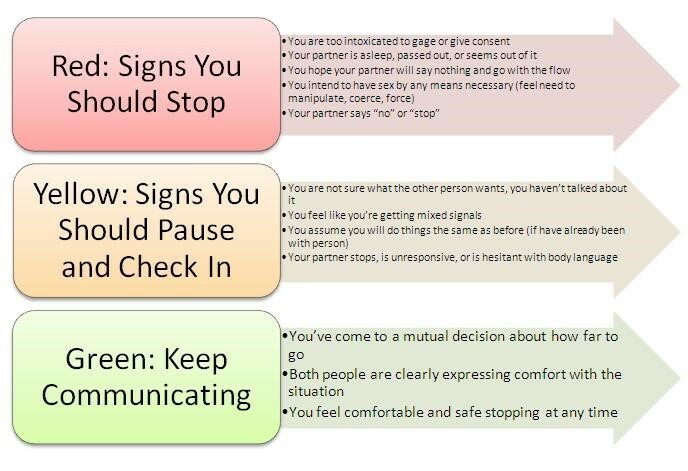 Consider having these conversations during a time when you’re not being physically intimate. Do you want to slow down? Do you want to go any further? They pressure or guilt you into doing things you may not want to do. They make you feel like you “owe” them — because you’re dating, or they gave you a gift, etc. They react negatively (with sadness, anger or resentment) if you say “no” to something, or don’t immediately consent. They ignore your wishes, and don’t pay attention to nonverbal cues that could show you’re not consenting (ex: pulling/pushing away). California is the first state in the nation to have an "affirmative consent" law also known as "yes means yes." The law was enacted to combat the rise of sexual assaults on college campuses.